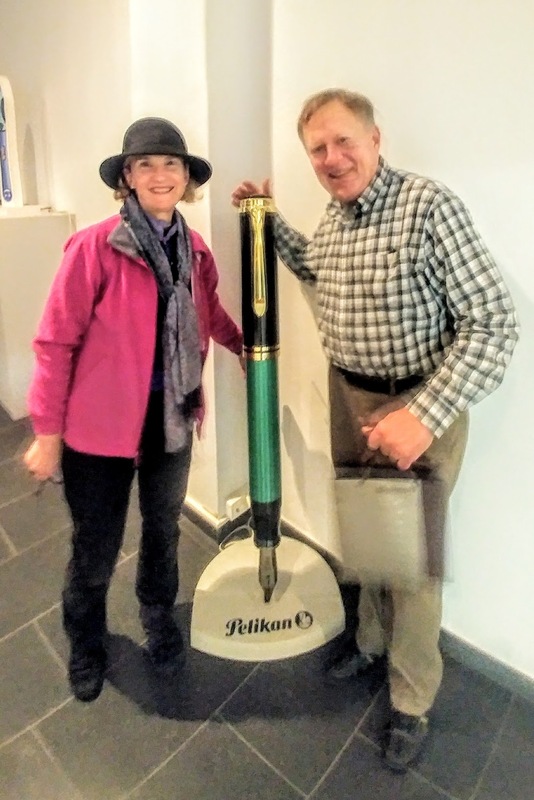 I was recently contacted by John Taylor who, along with his wife Nanci, had the good fortune to tour the Pelikan factory in Voehrum/Peine, Germany during a trip abroad this past January. John and his wife reside on the East Coast of the United States and have only been into pens in a big way for the last year or two. Not having a platform of his own, John asked if I might host a recap of their experience here at The Perch. While I have not entertained a post written by a guest author previously, I thought that it may be of interest to those who, like myself, are unable to make the pilgrimage to Pelikan’s factory. If you do have the means and the opportunity, I will include some pertinent links at the bottom of this post which will help you facilitate a similar visit. Without further ado, I give you John’s write-up. I hope that you enjoy it and please, leave a comment to let us know what you think. 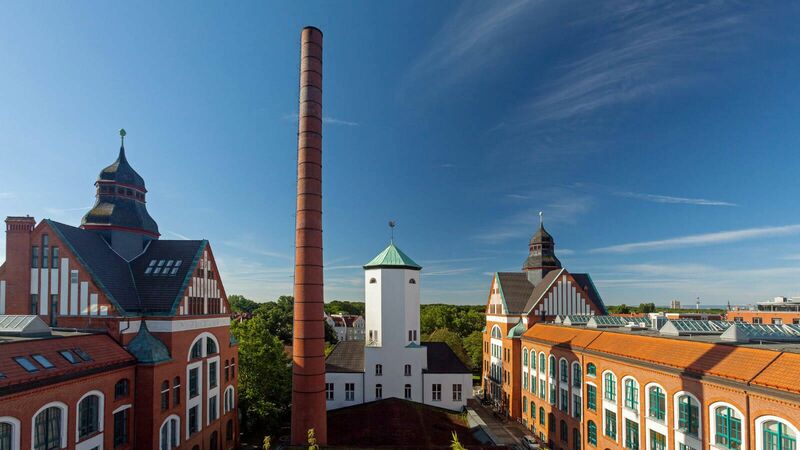 While planning our January trip to Germany, we looked for fine pen companies that offered tours of their pen factories. Happily, the one that popped up was Pelikan near Hannover, Germany. On one designated day in most months, they offer 2-hour factory tours with an option for a “Make a Wish Nib” custom fitting at its factory. We opted for just the tour at €15 (~$18.27) each. We reached out initially through their link, ignoring their online form and instead corresponding by e-mail. The personal correspondence with the coordinator, a wonderful lady named Silke, was professional and prompt. She signed us up and gave us very good directions. In response to my question about suitcase storage during the visit, she offered to simply keep them in her office. After many rookie questions from me and thoughtful responses from her, we were all set. 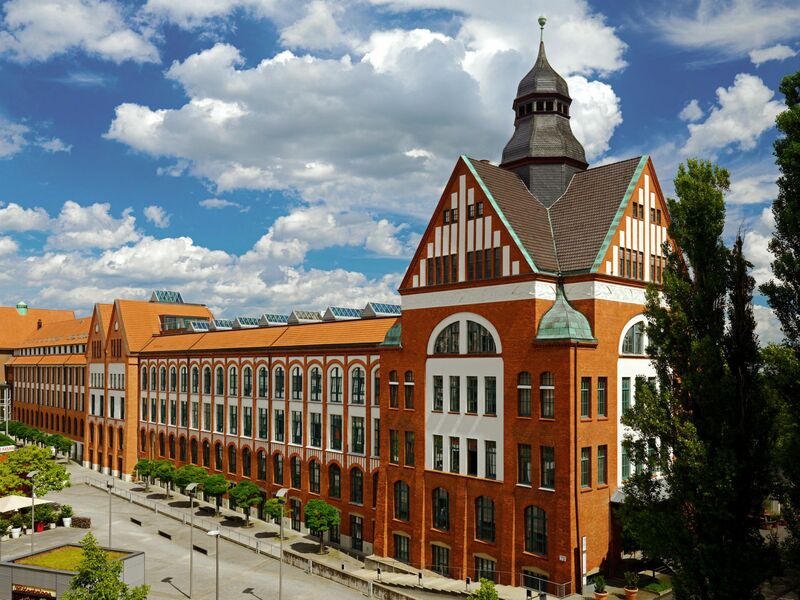 From 1906-1995, the Pelikan pen factory was located in Hannover, Germany and just five easy tram stops from the central train station. More recently, the factory was rehabbed into a wonderful Starwood hotel called the Sheraton Pelikan. The welcome gift to arriving guests is a tin of Edelstein garnet cartridges. And yes, we both brought our vintage Pelikans with us to see where they were born. The hotel was great, but greater things lay 50 yards behind the hotel that we only knew about because the factory folks had tipped us off. A pen buyer’s dream: a Pelikan factory store. We think everything that Pelikan makes was there in that shop including school pens, highlighters, and ink. More important, the wonderful fountain pens that we are all familiar with were displayed around the shop. The prices of the pens were incredibly good, enough so for us to leave with an M805 Ocean Swirl, an M805 Stresemann, many inks, erasable highlighters, school pens, more ink, etc. Wonderful early Valentine’s Day gifts! The new (1995) factory is about 25 miles outside of Hannover in a town called Peine. It’s about a 20-minute ride by train from Hannover Central Station. As suggested by our factory contact, we arrived in Peine about 40 minutes ahead of the tour time and took one of the waiting cabs ten minutes to the factory itself. Note that while the Vöhrum-Peine train station was a little closer to the factory than Peine, there was no taxi stand there. Stay on the train until Peine. For the factory tour that day, there were only 3 booked: us two Yankees and a Chilean distributor, all English-speakers. The tour was led by a senior executive of the factory who was in charge of plant logistics and quality control. He knew the production process in great detail. While waiting for the tour to begin, we started comparing the Pelikan pens we each happened to be carrying. I was sure that my 1952 140 would win the vintage prize but he won with a 1933 bright red Pelikan pen. We were asked not to take any pictures or discuss any future products that we might see. We honor that but will say that their color palette for pens is expanding! We walked through the entire plant where automated equipment at each station made school pens alongside craftsmen crafting components for the M100 through M1000 series pens by hand. We also got to see the molding of the ink cartridges and observed the mesmerizing filling line in action. They must have known that my favorite ink is the 4001 Royal Blue (“Königsblau”) because that was the flavor of the day. We were impressed by how open they were about the process. We actually walked among the various work stations watching the craftsmen and craftswomen at work. They each seemed happy to show us what they were doing. Our guide dispensed helpful tips along the way. For example, the nibs and their feeds should be considered mated for life and should always be kept together as a unit. Pelikan’s fine writing instruments and 4001/Edelstein inks are all made there. The tour ended in the store at the factory where there is a nib-fitting station for those who so opt. Afterwards, they dropped the two Americans off at the Vöhrum-Peine train station to take the hourly train back to Hannover. Our Chilean colleague took a cab back to the Hannover hotel. It was an incredible experience and it was about as up close and personal as it can get! When we got back to the states, guess which of the several pens we bought in Germany got inked first? John & Nanci Taylor live in the Blue Ridge Mountains of Virginia and have just started attending pen shows and collecting pens. So awesome. I am jealous and now want to go too. Thanks for sharing their story, Josh! You’re welcome. I too loved reading about such a great experience. Hmm… Too bad it’s something 4000 miles away from me. What a great story – thanks for sharing! The next time I’m in Germany I might just arrange a tour. Amazing trip, thank you very much for sharing it! This tour in case i am nearby the factory will be mandatory! What a great article! IF I ever get to Germany, I would certainly enjoy seeing the best fountain pens, in the world, being made! Wonderful story and I would love to take advantage of the trip at some time. I have been to Germany a few times for work (we trained some of our drivers on the new trains built for us at Siemens) and have always been taken by the welcome that the German people gave us. Thanks for the verbal tour of the Pelikan factory. It’s something I hope to do someday! I will have the opportunity to visit the factory story in Hannover this summer and that will be enough for now! You’ll love the prices! And they do have everything there. You may have to ask at the hotel front desk where the factory store is – it’s across the courtyard and up one floor. No big signage. Sounds like a true hidden gem. Josh thanks for sharing this, what a cool story and something to consider if / when I get to travel to Germany. You’re welcome. Glad that you enjoyed. What a wonderful story! I am determined to someday make this trip and tour the factory, too. My husband and I do plan to get to Germany in the not-too-distant future, and I will make every effort to put this stop on our itinerary. So glad to hear how welcoming the Pelikan people were. I didn’t expect anything less, but it’s nice to hear of someone else’s great experience in this regard. I hope that you’re able to arrange it. Definitely report back if you do. Good luck and safe travels. Thanks to the author and to you for sharing this. Brief enough to keep up the interest but highly informative. I feel I know quite a bit more about Pelikans now. You’re welcome. Glad that you enjoyed and got something from it. A great change-up for the Pelikan’s Perch! This looks like an interesting side trip when visiting Europe. As for me, I don’t think I could resist the ‘make-a-wish’ nib option. Any idea what the nib customization might cost? And is that option only available as an addition to the tour? By that I mean, the tours are only available once a month, but is that the case for the nib customization? Take a look at the link to the Pelikan site at the bottom of the post. The webpage has prices and talks about the nib fitting as an add-on to the tour. I would email them directly and ask about a standalone nib fitting at the factory. I think the email address is nib@pelikan.com. You can do the nib customization together with the tour or as a stand alone. The website linked to in the post lists the dates for each. They have guidelines about how you should schedule if you wish to do both. They budget one hour for a nib customization and the price is determined by the cost of the nib with an additional 40 euros added for the labor. You cannot bring your own nib.